Craft Architects completed a new corporate headquarters for Exotic Metals; a locally owned company providing precision tooled parts for the aircraft industry. The project consists of a single-story fully heated manufacturing space along with two-stories of corporate offices. The office space includes engineering, research and development testing facilities. Craft designed the original 227,000 SF shell as speculative that was fully leased to Classic Accessories prior to commencement of construction. The tenant space includes 27,700 SF in 2-story office with a large testing lab and photography studio. Craft Architects completed a new corporate headquarters for Harper Engineering; a locally owned company providing precision tooled parts for the aircraft industry. The project consists of a single-story fully heated manufacturing space and a semi-heated distribution area along with two-stories of corporate offices. The office space includes engineering, research and development testing facilities. Craft originally designed a 43,000 SF warehouse addition to Shasta’s existing rail served distribution facility. Next came a remodel of their existing corporate offices along with a new free-standing warehouse shipping office along the loading dock. Maintaining access to the existing rail spur was key during the site planning and construction phasing along with adding security fencing between the rail and the building. The facility also remained operational during the construction of the addition and the installation of a new large underground storm water retention vault in an active area of their truck court. As a leading international provider of more than 500 beef jerky and sausage products, Oberto Sausage Company is continually growing and expanding. The principal of Craft Architects has been working with two generations of the Oberto family since 1996. 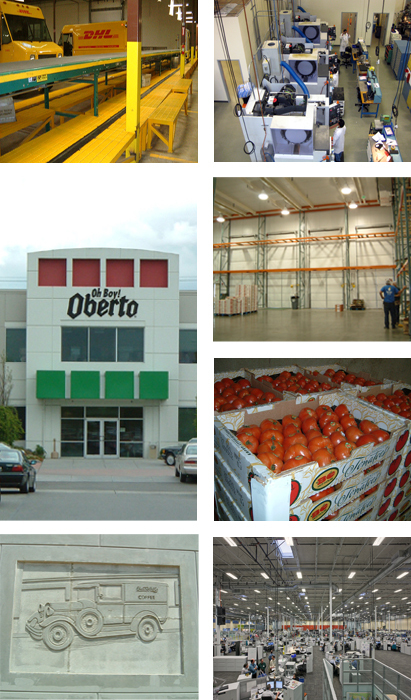 We continue to assist Oberto with numerous projects, including the expansion of a smokehouse, maintenance and packaging facilities, and expansions requiring onsite mitigation of wetlands and environmental reviews. Craft was introduced to IPT when they purchased a newly designed building that they designed for The Benaroya Company. Craft is currently working with IPT on two sites. The first site is on Port of Tacoma leased land and includes two buildings totaling 1.12 Million SF. The second Sumner site has one 229,000 SF speculative shell. Originally built as a speculative distribution warehouse by The Benaroya Company and Industrial Income Trust, this 440,000 SF facility lies on a 25 acre site located in Sumner, Washington. The facility has ample trailer storage as well as direct rail access, making it an ideal distribution warehouse location. This project is pursuing LEED certification and includes 2,500 SF of office space. Craft Architects provided owner's representation, interior design, and limited construction administration for a ground-up building for Apffels' corporate headquarters and coffee roasting plant in southern California. The building details included sculptured murals on the exterior depicting scenes from Apffels' rich history dating back to 1914, slate floors, a uniquely designed lobby staircase, as well as archive photo displays showing the history of Apffels. An original art deco streetlight from their former location was donated by the city of Los Angeles.